BeanStalk Hair Growth has received overwhelming feedback from its customers indicating that its Hair Growth Infusion works as a powerful standalone hair growth supplement, as well as an ideal supplement to a new wearable device called IGrow. BeanStalk Hair Growth Infusion is a robust hair loss treatment that has been tested in professional salons for three years and has been proven to stop balding and thinning due to conditions including alopecia, eczema, and psoriasis. The proprietary infusion includes a proprietary blend of biotin, niacin, zinc, tea tree oil, Vitamins B and E, and yellow amaranth extract. The easy-to-use infusion is simply massaged into the scalp for 10 minutes to stimulate blood flow, and users can expect to see results within 2 weeks. Treatments for hair loss have recently been in the news, and the Huffington Post recently reported that one treatment could reverse baldness by blocking enzymes. BeanStalk Hair Growth’s Infusion can be used seamlessly with these types of hair loss treatments to enhance and aid the hair regrowth regimen. Recently, the FDA cleared the IGrow hair growth system. Users wear a helmet in which lasers stimulate cellular activity within the hair follicles, and BeanStalk Hair Growth says that their hair loss treatment can work in conjunction with this system. “Since our Infusion is an all-natural, proven product that helps increase the growth rate of hair growth in men and women, it’s suited for use with these breakthroughs,” said the BeanStalk Hair Growth team. “We know that everyone cannot afford $1,500.00 for hair plugs. There are alternatives to surgery when it comes to hair loss and hair regrowth. 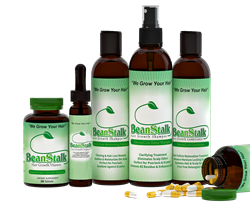 BeanStalk Product’s customers Atlanta have saved thousands of dollars, after using our Infusion for 3 months, because, they did not need the same number of hair plugs after the regimen,” said the BeanStalk Hair Growth Products team. Since its launch on Amazon, BeanStalk Hair Growth Products has received an overwhelming amount of positive feedback from its customers. One recent customer said, “I’ve only been using this product for 2 months. I have noticed my bald spot starting to fill in with hair. Another recent customer commented, “I used this product on my fiancé’s hair. He has an area in the front of his head that has been slowly thinning. Founded in 2012, BeanStalk Hair Growth Products believes beautiful hair starts from within, using safe natural ingredients in formulas that are clinically tested and proven to work for all cultures. BeanStalk Hair Growth Products is committed to delivering lasting results with affordable, healthy solutions, to enhance and preserve your natural beauty. BeanStalk Hair Growth Products has granted more than 9,000 men and women, an experience that truly changed their lives. Today, BeanStalk Products are distributed in America, Kenya and Canada, but the company will launch in the U.K and Australia in 2016.